1) You have more dog beds, chew toys, collars, leashes, harnesses, and dog crates than you have dogs. 2) You meet other people with dogs, and remember their dog's call name after 30 seconds, but don't get the owner/handler's name until you've met them 2 or 3 times. 3) You don't think twice about trading licks of an ice cream cone with your dog. 6) You have hundreds of pictures of your dogs on your desk at work, in your wallet, etc., but none of your family or yourself. 7) No one wants to ride in your car because they know they'll get dog hair on their clothes. 9) You've had long meaningful discussions with your friends on the best way to trim your dog's nails, but have never had a manicure or pedicure in your lifetime. 10) Books and movies are ruined for you if the dog references are incorrect. 11) The highlight of your day is spending time with your dog. 12) You watch simply awful movies because your breed is either featured in a cameo scene or there's a 3-second camera shot during a crowd scene. 13) All of your clothes have dog hair on them, even when they come back from the Laundromat or dry cleaners. 14) The only thing your friends, colleagues, and passing acquaintances say to you when they see you is, "How are the dogs?" or "How many dogs do you have now?" 15) Your photo Christmas cards feature your dogs (humans optional). 16) Your jewelry box contains no jewels - just those fasteners from vari-kennels. 17) Every time you read the name, Bob, you think the guy's first name is Best of Breed. 18) You ask your vet if you can ride in her sports car sometime. 19) Your house isn't carpeted - the fuzzy furballs under your feet are soft enough. 20) Your hungry hubby comes home from work, lifts the cover of the pan on the stove and says, "Is this people food or dog food?" 21) Your hungry hubby once ate the dog food and asked for seconds. 22) Your mother-in-law keeps asking when you are going to have children. 23) You don't give a second thought to using the brush you just used on your dog to give a quick run through your own hair. 24) At your dinner parties, you always double check the butter before putting it on the table. 25) You put important papers in your latest issue of your breed magazine. You know you will find them there. 26) You have dog hair stuck on tape on wrapped gifts. 27) You have dog toy/treats in your briefcase. 28) You have several albums filled with the 8 by 10 pictures of your dogs, but you can't locate any pictures of your kids to send to grandma. 29) You show up at the car dealers with a ruler, to measure and see if your big dog crate will fit. Before the actual purchase, you make the dealer cringe by insisting that you load both crates and dog into the shiny, new vehicle to make sure it works! 30) You can't get the groceries in the car because its: a) already full of dog food or b) you have that big old crate in there. 31) You visit relatives only if there is a dog show nearby. 32) You remove all the seats from the van except the two in the front so you have room for crates. 33) The passenger seat is full of dog stuff. 34) You cringe at the price of food in the grocery store, but think nothing of the cost of dog food or treats. 35) You have six squeaky hedgehogs...but only one with a squeaky that works. 36) Your mother knows the implication of a "major breaking". 37) You put popcorn in the clean dog dish for a movie treat. 38) You pull out your credit card and little bits of liver are stuck to it. 39) When you get your latest roll of film and there isn't a single picture of a two-legged person in it. 40) People at work have stopped offering you their lint brushes. They realize it is a hopeless case. 41) Friends no longer ask, "how was your weekend"; they ask "how did the dogs do?" 42) All babies and youngsters are "people puppies". Ahh…my vacation was great. So great in fact that I forgot all about everything electronic and just hung out with the dogs and my husband in the great outdoors all week! It was awesome. 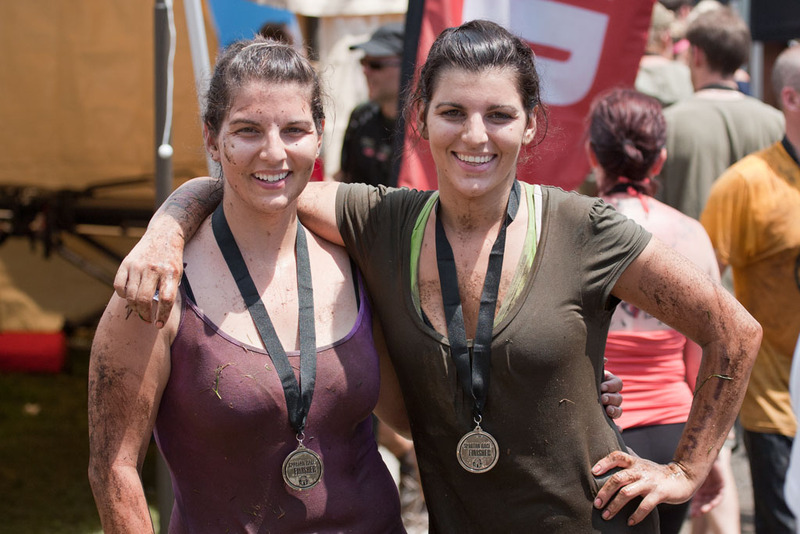 To celebrate my last day of vacation, yesterday I participated with my younger sister in “Ottawa’s” Spartan Sprint. I say “Ottawa” because the event was actually held at the Camp Fortune ski hill in Chelsea, QC. I’ll be honest – I haven’t worked out in a few months and the weight has slowly been creepin’ back on – about 12 pounds over the past 2 and half years (right on the national average apparently). I had the good intention of training for a few weeks before hand but it just never happened. So, the day arrived and even though I was not in the best physical condition it wasn’t going to stop me from trying. The race started out by heading right up a hill – OMG!! The thought crossed my mind that I might not be able to finish but I pressed on as I had only just started. Thankfully downhill was less challenging – my extra mass helped propel me downhill. 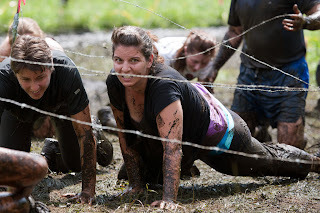 Over a short wall and into a mud crawl under the barbed wire. 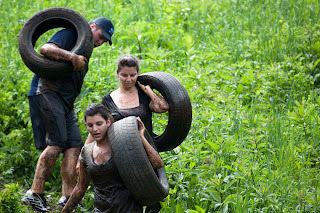 Up another hill with a tire and back down into another mud crawl under more barbed wire! Up another hill, a rope climb, down the hill. Push-ups, up another “hill” (by this time the qualified as mountains), down the hill, water wade, sewer crawl, brick dragging, a higher wall, a javelin throw, ice crawl under more barbed wire to the dual against the “Spartan Warriors” and a final leap over the flaming logs and across the finish line! All the while the sun pounded down, no wind or even a hit of rain in the sparsely there clouds. Funny enough during my 1 hour and 20 minute run I was not once thirsty or hot – I think I had sun stroke, not good. It was definitely a challenge but it was a great experience and I am glad that I finished. I am even more glad that I had the opportunity to do this with my sister! We’re going to try again next year and hopefully improve on our course time. Check out this video I found about our event. See you next year Spartans! !